cannabinoid rich products and material for human consumption. standards for the emerging CBD industry. THE ICCT CERTIFICATION TEAM HAS ACCESS TO THE LATEST SCIENTIFIC EQUIPMENT TO DISCOVER AND QUANTIFY ALL THE COMPONENTS IN A SAMPLE. Using cutting edge analytical equipment, we can detect and quantify a precise molecular snap shot of cannabinoid rich material. We use metabolomic fingerprinting technology. Metabolomics can be defined as a new emerging -omic science in systems biology that can decipher the metabolic profile in complex systems through the combination of data-rich analytical techniques (NMR, MS) and multivariate data analysis. Metabolomics leaves behind the reductionist method of investigating single component effects on a biological system and goes a little further offering a holistic approach in the exploration of the molecular details of multiple factors on an entire biological organism. Metabolomic techniques allows for a high throughput analysis of small molecules (metabolites) in biofluids and tissues giving metabolic profiles as the end product. Comparison of such profiles from different phenotypes can be used to identify specific metabolic changes leading to the understanding of biochemical pathways, complex biomarker combinations, toxic effects and disease progression. The main application of metabolomics to mammalian systems are related, among others, to: phenotyping, biomarker discovery, clinical studies (diagnosis disease and therapeutic efficacy), toxicology (preclinical drug candidate safety assessment), etc. This testing is the backbone of ICCT certification. The Safe,Effective and Legal Implementation of Cannabinoids in a Medical Practice. More than ever, clinicians are challenged with ever-growing advances in available clinical tools. Deciphering what is evidence based vs. “fad driven” can be a very daunting task. 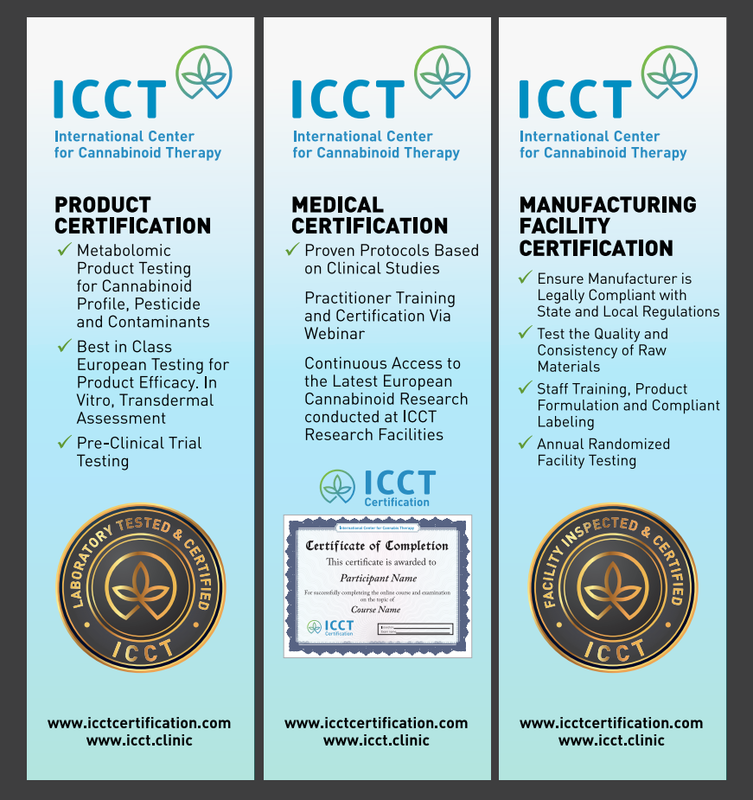 Our ICCT certification training program provides the busy clinician a solid scientifically and clinically relevant understanding of how to employ HEMP with various health conditions. Discussion of clinical cases, dosing and a better understanding of the regulatory freedom to flex your ability to help patients with HEMP therapeutics will also be reviewed in one of the lectures in our 8-lecture series web-based certification program.